As libraries and archives across the country recognize Preservation Week, our Program Manager Matt Richardson provides us with the following, highlighting the American Library Association’s planned activities and advice on practicing preservation on those personal collections at home. “Pass it on!” The American Library Association’s annual Preservation Week is happening now, April 27 through May 3, 2014. ALA organized the first Preservation Week in 2010 to highlight the importance of preserving materials representing our cultural heritage that are held in collections across the country. But Preservation Week is about more than just the nifty things held in libraries’ hopefully-climate controlled stacks (don’t worry—ours are!). It’s also an occasion for professionals to reach out to the public and share what they know about caring for important objects. After all, who doesn’t have an old scrapbook, photo album, or other family keepsake stashed somewhere prompting the occasional “Oh yeah, I need to do something about that”? To help, ALA’s Association for Library Collections and Technical Services and its partners are promoting a number of events and resources, including two free webinars this week. If you’d like to find out more about how to protect your collections, presentations from years gone by (and being able to access stuff from the past—isn’t that the whole point here?) are available on the ALCTS webpage. In addition, the Library of Congress’ Preservation Week page offers a plethora of information including descriptions of conservation treatments and webcasts from last year’s events. And, of course, to learn more about those nifty things we’re in the business of preserving, safeguarding, organizing, and describing, pay us a visit! The breadth and depth of resources in the the Houston Hip Hop collections continue to grow with today’s announcement that the HAWK Photographs and Memorabilia are now available for patrons’ virtual perusal at the University of Houston Digital Library. HAWK, or John Edward Hawkins, was born and raised in Houston and, along with his older brother Patrick Lamark Hawkins (Fat Pat), was an integral component of the Screwed Up Click (a group of Houston area rappers centered around the pioneering production work of DJ Screw). HAWK, Fat Pat, DJ Screw, and their friend Kay-K would go on to create the collaboration Dead End Alliance (D.E.A.). 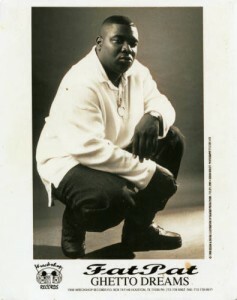 Before Fat Pat could realize the success of his debut album Ghetto Dreams, he was shot to death in 1998 at the age of 27 and the album was released posthumously. 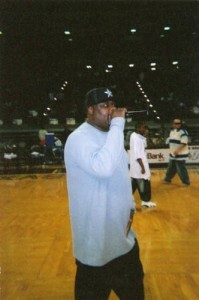 HAWK’s solo debut, Under H.A.W.K.’s Wings, was released by Dead End in 2000, followed by his sophomore release HAWK. However, after marrying longtime girlfriend Meshah Henderson in April 2006, John Edward Hawkins’ life was also tragically cut short when he was shot to death on May 1, 2006 at the age of 36. Endangered Species, released following his death, would help continue the musical legacy of the S.U.C., D.E.A., and the Hawkins brothers. 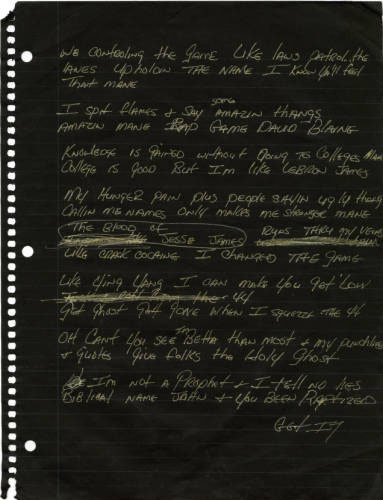 Here at the University of Houston Special Collections we are proud to preserve that legacy and make the HAWK Papers available for study to scholars interested in Houston hip hop. The addition of these materials to the Digital Library, combined with the previous DJ Screw Photographs and Memorabilia and Pen & Pixel highlights, has us excited about the increased online access to a burgeoning field of research. 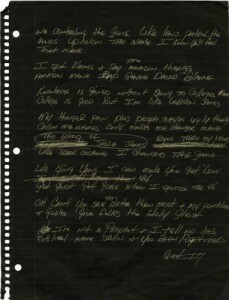 Among the highlights in this new Digital Library collection are publicity photographs, candid snapshots, as well as a personal favorite of mine, a notebook belonging to HAWK replete with his lyrics handwritten in gold ink on black pages. Please enjoy these new items available for study in the Digital Library and come see us when you are ready to study all of these, and more, in the Special Collections Reading Room. Last week the C. T. Bauer College of Business hosted their third annual Gold & Silver Cougar Alumni Luncheon, where current Bauer students mixed and mingled with graduates from 25 and 50 years ago. 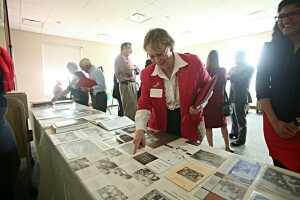 The University of Houston Special Collections contributed to the festivities as University Archivist Mary Manning and Program Manager Matt Richardson attended the reunion, showcasing a veritable mobile museum of artifacts documenting the history of the C. T. Bauer College of Business as well as the storied history of the university. 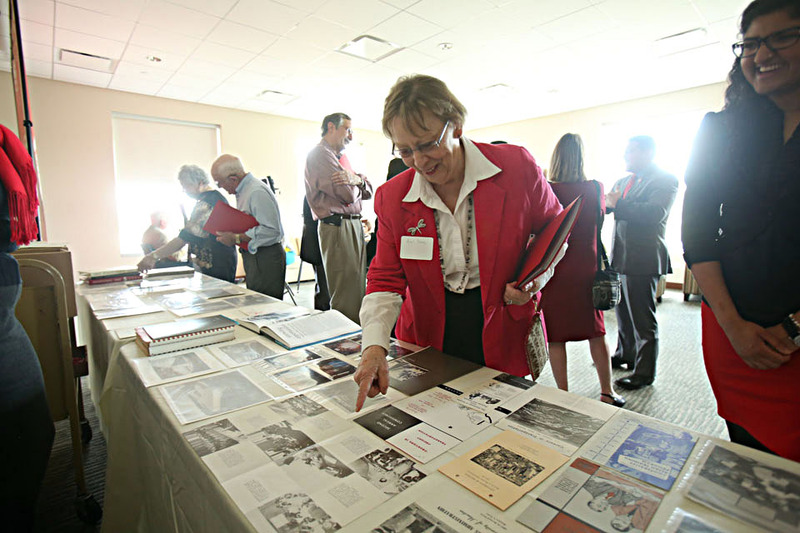 Pulled from a number of collections in the University Archives, the tabletop displays prominently featured the Bauer College of Business Records and UH Photographs Collection, including old College of Business brochures advertising various focuses of study (including Air Stewardess training! 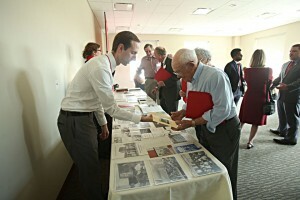 ), photographs and documents chronicling the construction and dedication of Melcher Hall, commencement programs from the 1964 and 1989 classes being honored, as well as yearbooks and various items showcasing UH Traditions (like Frontier Fiesta) and athletics milestones (like the Game of the Century). A rare treat indeed to see these gems away from their cloistered confines in the Special Collections Reading Room and those in attendance seemed most appreciative as they strolled down memory lane. More pictures of the Bauer Gold and Silver Cougar Luncheon can be viewed here. All of the artifacts mentioned above, and more, are available for study with a simple trip to Special Collections. College Ice Hockey… in Texas? Our congratulations to the Union College Dutchmen who upset the top-seeded Minnesota Golden Gophers in Philadelphia over the weekend to claim their first ever NCAA men’s collegiate hockey national championship. Union College triumphed in a bit of a Cinderella story, emerging as champions of the Frozen Four by defeating the the likes of Vermont, Providence, and traditional collegiate hockey power Boston College before skating past the Gophers with a 7-4 victory. And here at the University of Houston, we know a thing or two about traditional collegiate hockey powers. Oh what’s that, you say? They don’t play real hockey in Texas and the University of Houston, of all places, certainly does not have a rich hockey tradition. Oh ye of little sporting history. 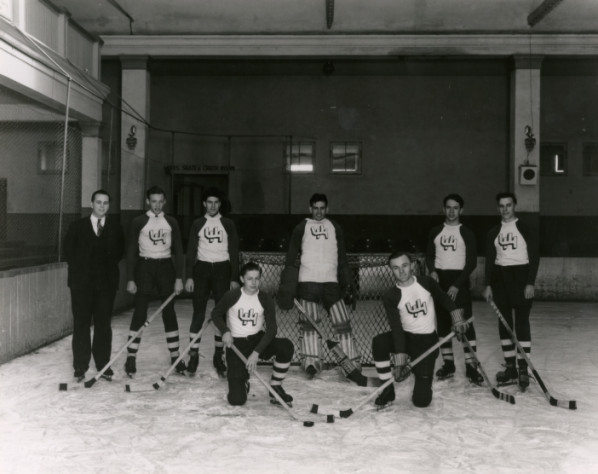 For a few years the hockey program lay dormant until 1939 saw a new hockey team become the first sport to be sponsored by the newly chartered University of Houston. The high water mark for Cougar hockey may have been the 1940 season as they attempted to reclaim a city title stripped from them just a few years prior. This time there were no questions about incomplete schedules when a would-be dream season saw a regular season split with “Rice Institute” deal the Cougars their only loss and the Owls would go on to win a unique tie-breaking scenario, claiming the city championship for themselves. From there, it would seem, enthusiasm for a University of Houston hockey team melted under the heat and humidity of Houston. A war was waging half a world away and the nation’s youth turned their attention away from diversions like collegiate athletics. Once the war was over and the veterans returned home, the diversions returned as well. UH ice hockey, however, would not make a comeback and, to this day it persists in its slumber. But, who knows. In a 21st century where everything old is new again, perhaps that sleeping giant will wake up soon. Heads up Cougars! It’s Final Four time! No, we haven’t stepped into a time warp. And, no, our Cougars sadly will not be amongst the likes of the Gators, Huskies, Badgers, and Wildcats this weekend as they square off to determine college basketball’s national champion. However, fans of the Red and White may notice a little Cougar hue to the TBS coverage prior to the Final Four on Saturday. 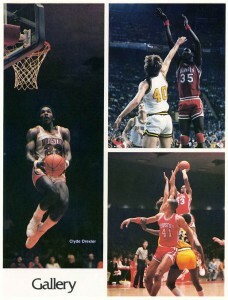 As part of their pregame analysis and with the help of resources from the University Archives here in Special Collections, the TBS team will take a look back to those glorious years in the early 1980s, when the Coogs’ dunking and dominant style of play struck fear in the hearts of basketball teams across the nation, but ultimately claimed a dubious distinction–becoming arguably the best team in history to never win a national title and being on the wrong end of one of college basketball’s most monumental upsets. We understand if the diehard Cougars out there don’t want to relive the pain, again. But, for those of us who can’t get enough of those glory days, coverage begins at 3PM EST, 2PM Central with “The Road to the Final Four.” Be on the lookout for some old Houstonian yearbooks, chock-full of “Akeem the Dream” (sans the “H”), “Clyde the Glide,” and the rest of Texas’ Tallest Fraternity, to make an appearance during “The Final Four Show” airing at 4pm EST, 3pm Central.